From West Oakland the marathon course heads east on 28th and 27th Streets crossing the early part of the course on Broadway in Auto Row heading for the north shore of Lake Merritt and the Adams Point neighborhood. For me, this area brings back my earliest adult memories of Oakland, because I lived for about six months in this neighborhood in 1979 when I worked for TWA in San Francisco. I would get reaquainted with it many years later when I met my partner Keith in 1995, who lived there then. Adams Point contains an interesting mix of housing, consisting of a few tall relatively modern buildings, beautiful apartments from the 1920s through the 1940s, and some mostly not-so attractive apartments from the 1950s and later. Additionally, there are some grand homes of the early 20th century, some of which remain single-family residences while others have been divided into apartments. The picture at right is of a pagoda-like bandstand in Lakeshore Park with the mid-century modern Kaiser headquarters building behind it. The picture above is slightly misleading as, in fact, an arm of Lake Merritt lies between the bandstand and the Kaiser building. The path that you see hugging the shore of Lake Merritt endures the footsteps of who-knows-how-many runners each day. A purist would not really say the location of Oakland's new Catholic cathedral ("Cathedral of Christ the Light") is in Adam's Point, but it's steps away and an impressive modern structure. Bellevue Street curves through Lakeside Park. The magnificent building you see that dominates this picture is the Bellevue-Staten, an apartment building (now a condominium) built in 1929. Keith and his family called it "The Princess" and it's fitting. A close look at the facade at the entrance to the Bellevue-Staten building. A gentle slope from Lakeside Park dotted with Oakland's namesake oaks and other trees. This 1920s apartment building on Bellevue was where I lived for a brief time in 1979. Surprised to know that Oakland has a Whole Foods? It does. At Harrison, 27th Street turns into Bay Place which in turn ends three short blocks later at Grand Avenue. Runners pass in front of Whole Foods just before passing the 22-mile mark in the race. The building is a clever example of adaptive reuse. Vacant since the mid 1990s, it had been a Cadillac showroom since the 1920s, but had originally been built in the 1890s as a power station for a streetcar system. Whole Foods opened here in 2007. The marathon continues from the Jack London Square area west to the area known as West Oakland. This is an area that some would say epitomizes what Oakland is known for. And, yes, there are parts that are quite tough. Yet there are also splashes of color, some nice quiet streets with lovely Victorians, and a large portion that improved, but sadly only in the aftermath of a tragedy. West Oakland historically has been an African-American community. 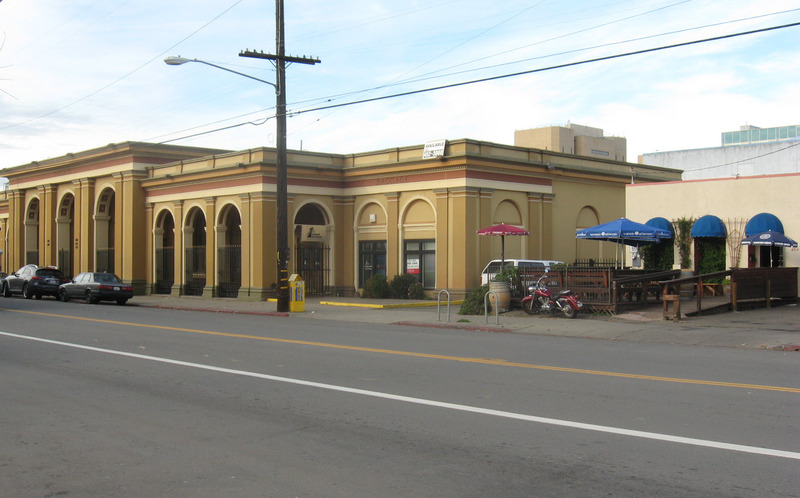 Proximity to the old Oakland train station, and the facilities of the Southern Pacific Railroad led many black men who worked for the railroad and their families to locate here. In addition to the railroad, the port, the Oakland Army Base, and many industrial concerns employed a lot of blue collar workers of many backgrounds. After WWII, the area went into a slow decline as the railroad needed to employ fewer to staff the declining number of passenger trains. In the 1950s, the double-decker Cypress Freeway was constructed through the heart of West Oakland creating an unsightly concrete wall through the area. That came to an end on 17 October 1989, when the Loma Prieta quake struck and caused the structure to collapse, leaving 42 people dead. Years of political bickering after the quake led to the wise decision to rebuild the 880/80 connection to the west of West Oakland. The right-of-way where the Cypress structure once stood was made into the much more aesthetically pleasing Mandela Parkway. Most of the route of the race in West Oakland is along the parkway. Depressing public housing that was literally in the shadow of the freeway emerged back into sunlight. Some was torn down, while some was dramatically renovated. Gentrification is coming to parts of West Oakland. It makes sense because it has a great location (West Oakland BART is one stop away from downtown San Francisco through the Transbay Tube), excellent weather, and a large stock of Victorian homes. West Oakland was where the Black Panther Party was founded in 1966, and from where it would grow to have chapters in many American cities with substantial black populations. Here is a map that locates a number of the sites of historical significance during the era of the Panthers. Guided tours are also conducted. As an historical footnote, Bobby Seale, one of the founders of the Black Panther Party and defendant in the Chicago Eight trial/circus, would run for mayor of Oakland in 1973. He came in second. The African American Museum & Library (part of the Oakland Public Library) isn't exactly in West Oakland but it is just west of downtown Oakland at 14th Street and Martin Luther King, Jr. Way. 15 years ago it would have been a stretch to call the Jack London Square area a neighborhood. But in that time, many of the old warehouses that predominated have been converted to lofts and condos, and many new residential structures have been erected. The center of the Jack London Square area is where Broadway ends at the Embarcadero. What will be interesting to see in coming years is whether the newly built Jack London Market is successful. This colossal development at the east end of Jack London Square and across from the train station, aims to replicate the success of San Francisco's Ferry Building as an artisan food marketplace in the East Bay. An article from July 2010 in the East Bay Express describes the challenges ahead. Solid brick buildings like the American Bag Co. at right were the norm in the area surrounding Jack London Square. There are still many of them, though most of the large ones have been renovated for reuse as offices, lofts, or condos. But across the street from the old building is this very new condominium. Its style is a take on an early 20th century warehouse but there is no mistaking its modernity. The streets look quiet in these three pictures taken around 3:00 p.m., but come back around 5:00 a.m. and it will look a lot different. This is the Oakland Produce Market. Once in the early 90s I took a day off just to see what happened in the early morning hours here. If you go there at an early hour, my advice is to watch out for the guys driving forklifts - this is their turf! Note the tall building -"The Ellington" -in the background - another new condomimium. Historic dive bar: Heinold's First and Last Chance. Jack London was here. Oakland's Amtrak station. Trains run in the street for about 4 blocks along the Embarcadero directly in front of Jack London Square. This is also the Union Pacific (formerly Southern Pacific) mainline track leading north, south, and to the Port of Oakland. There is a lot of coming and going by rail in this part of Oakland. On the same block of Third Street as Solely Vegan lies the old Western Pacific train station. When the original (pre-Amtrak) California Zephyr ceased operation in March 1970, the train station was no longer needed. It has had many uses since then. Up until not so many years ago, the mainline track (for freight) of the Western Pacific Railroad ran down the middle of Third Street on its way to the port. Eventually (late 90s?) the Union Pacific, acquirer of both the Western Pacific and Southern Pacific stopped using the old W.P. line in Oakland, and the track was removed from Third Street. Trains now operate exclusively on the Embarcadero. Beer Revolution is located in the modest building with the blue canopies just to the right of the old station. It's agit-prop Che Guevara meets craft brew. What the cool kids are drinking. This is the home of Blue Bottle Coffee, the ne plus ultra of Bay Area coffee. I was interested to see that besides a few other retail locations in the Bay Area, they have a roastery in Brooklyn, NY. But since I'm fond of Oakland's no-nonsense Chinatown, it's part of the tour. If you run the marathon you won't see any of scenes in the photographs to follow but you'll be very close, and you should come back another time to take a closer look. Bring your appetite as there are restaurants galore. I think of the heart of Chinatown as Broadway on the west to Alice Street on the east, bounded by 11th Street to the north and 7th Street to the south. A typical market with produce both outside and in. Prices are remarkably low. Chinese video store window, with political sign. ﻿As in other west coast Chinatowns, there is a significant presence now of Vietnamese. From the Dimond District runners continue on a downhill trajectory into the Fruitvale neighborhood. If you don't have time to make a visit to Mexico or Central America, consider an afternoon in Fruitvale instead. The neighborhood is predominantly Latino but if you are thinking exclusively of Mexico you should also include El Salvador, Guatemala, Nicaragua, and other countries. The primary business district - but by no means the only one - is along International Boulevard and Fruitvale Avenue. BART's Fruitvale station lies just west of International Boulevard and includes a transit village consisting of housing and businesses. A walk along International Boulevard is filled with sights, sounds, and tastes of Latin America. Next stop on the tour is the Dimond District. No, that's not a typo that should read "diamond", although that's how it is pronounced. The race skirts just east of the main business district of Dimond. ﻿This is where the race comes rocketing downhill into Dimond from the Mormon Temple. Fruitvale Avenue is the "Main Street" and business artery of the Dimond District. As with almost any part of Oakland, you'll find a wide variety of eating opportunities here. Just north of the Dimond business area is a lovely park, Dimond Park, which straddles Sausal Creek, and separates the Dimond District from the Glenview District. The Glenview area is not traversed by the marathon, but its small business area on Park Boulevard is very attractive.